“But why is Keanu Reeves sad?” This question must have perplexed at least half of his fans and naive internet users ever since a candid shot of the actor appeared on the internet and soon became a monster of a meme. 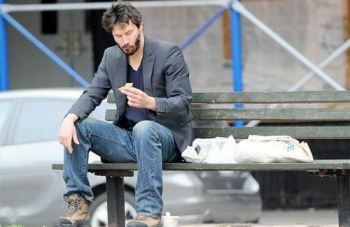 The paparazzi image where Keanu is seen in jeans and a blazer with unkempt hair and unshaved beard sitting on a bench looking depressed is a mere glimpse of his sad life. This image could have been a lot worse. From a superhero to a homeless guy, Keanu Reeves has played them all. But his personal life is his most difficult role yet. The actor has been plagued with personal tragedies ever since he was born but continues to cross each hurdle and live on without taking a break or going insane even once. Though he began his acting career at the age of nine, true stardom struck him only in his thirties. By that time he had seen so many ups and downs in his life that he probably cared nothing for fame. Born in Lebanon of a British showgirl mom and a geologist dad of mixed parentage, Keanu grew up in a broken home. He was never on good terms with his dad, whom he last saw at the age of 13 when the former was arrested for illegal sale of drugs. His mother relocated to New York and later Canada, marrying four more men. During this time Keanu started acting in TV commercials and small television productions. Despite being really good at ice hockey, an injury ruined his hopes of taking it up as a career, and before he took to full-time acting, he worked at various odd jobs from landscaping to making pasta. Tragedy struck him when his best friend River Phoenix died of overdose while still in his early twenties. This was just the tip of the iceberg. A few years later he met the love of his life and was about to become a father. Unfortunately, the baby was stillborn. The couple tried overcoming their grief and decided to get married but just a year after this sad incident, his girlfriend died in a car accident. All this happened when Keanu was at the pinnacle of success with The Matrix trilogy making millions at the box office. She was buried beside their stillborn daughter. It seemed like everything Keanu loved was being brutally taken away from him. His sister was diagnosed with leukaemia, though she’s now cured. A lot of his earnings have gone to paying her medical bills. His brother has been in and out of jail for several years. Keanu has never married and his loneliness came to a point where he was reported to have bought a cake for himself on one of his birthdays and had it alone, offering it to fans if they recognised him. He was perhaps the only Hollywood actor who didn’t own a house and lived in hotels or rented houses till 2003 when he bought his first house in Hollywood Hills. The superstar continues to live on and face everything with nerves of steel while still keeping his passions alive. He played bass for a couple of bands during the 90s and 2000s and enjoys horse riding and surfing. It is but obvious that a man who has seen it all will have a hard time smiling, and as he puts it in his own words: “Other people need happiness to live, I don’t”. All said and done, he owns a star at the Hollywood walk of fame and continues to impress audiences in his movies.